~ Cook it! Shoot it! Or the other way around. 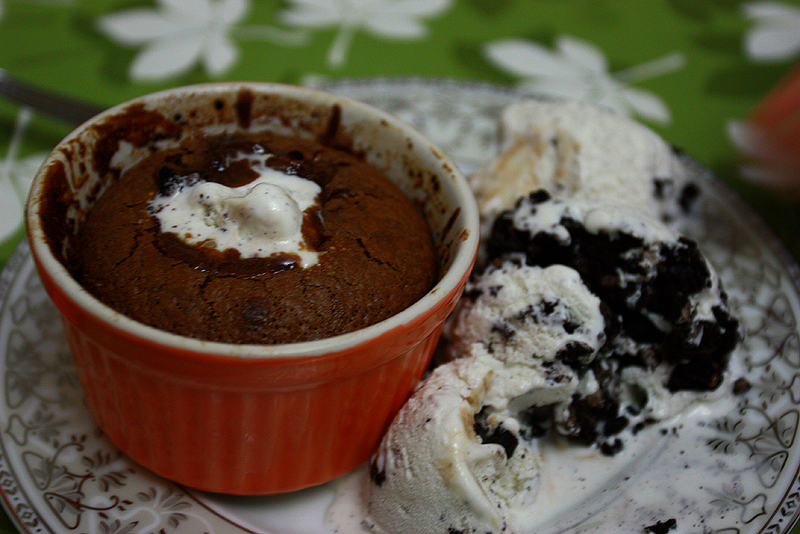 OK..learning how to make this incredible dessert – melted chokolate souffle – is a lot easier than it sounds. I was having a party one night and I was thinking of something special to serve at the end and this came to my mind. The great thing about it is that it takes only 20 min to prepare…12 min to bake…a great flavour…and it’s perfect for a dessert after dinner as it has a piece of coffee added. And the most important – it is so easy to prepare that there is no way for you to mess it up. Anyway I’ll give you some tips after all. 1. Heat the oven to 200°C. Use a brush to grease with butter 6 small souffle cups. They need to be greased very well. Put them in the fridge until the butter becomes solid. Grease them one more time, powder them with cacao and leave aside. 2. Melt the butter and the chocolate on a water-bath. In another bowl beat the sugar along with the eggs to a fluffy mixture. Add the chocolate, beat one more time, add the espresso and after that the flour. Beat well. 3. Pour the mixture into the cups. Put them in the oven and bake exactly 12 mins – not less, not more. 4. Serve the souffle with Vanilla ice cream. – The secret of the liquid inside of the souffle is the baking time. It should be baked for exactly 12 minutes. 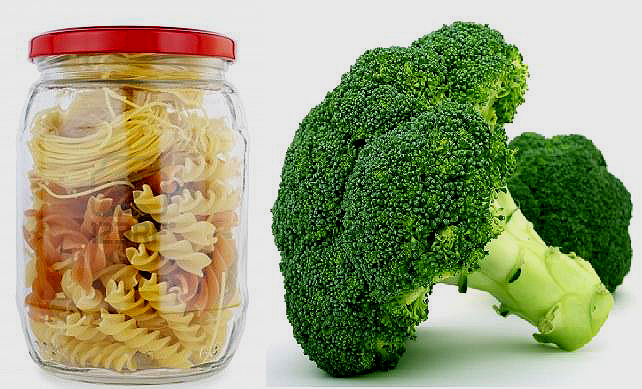 – The other great thing is that you can make it some hours/days before the event and put it in the fridge or even in the freezer. – You can choose other flavours except coffee. It can be done by several drops of rum, or cinnamon or even red hot chilli pepper. Some time ago I found the greatest combination for morning freshness. Everyone knows that I love the smell of coffee in the morning and there is nothing else that can fresh me up more than this but this is not what I have in mind today. I’ve read some articles recently about it and got really interested in the idea of good health and figure just from a simple thing – water+fresh lemon in the morning on an empty stomach. I was doing it for some time and I definitely can say it has a positive effect. I’m not sure if a person can lose weight by this ( even though each article I’ve read says so ) but for sure it gives a lot of energy for the day plus some other positives too. All you need is the juice from a fresh squeezed lemon and a glass of water with room temperature and if it’s too bitter add a spoon of honey. 4. Helps you keep your skin and figure especially combined with proper food. 5. Strengthens the immune system – of course it does – lemon is one of the richest plants on earth of Vitamic C and Water is the most important thing for the human body. Try it for at least a month and you’ll see the great effect. I wanted to share this really nice recipe which everyone can prepare when inviting people and suprise them with a special dinner. It’s actually very easy to prepare but looks very good as if you are in a 5 star restaurant;) I don’t feel like writing something special today so I’m just going to present the recipe. spices ( I used salt, black pepper, pepper mint and dried basil ). Wash the broccoli, the leeks and the eggplant very well and cut them into small cubes. Put them in a pan with some butter and a half cup of water and stew them for 12-15 min on a middle heated hot-plate along with the spices. 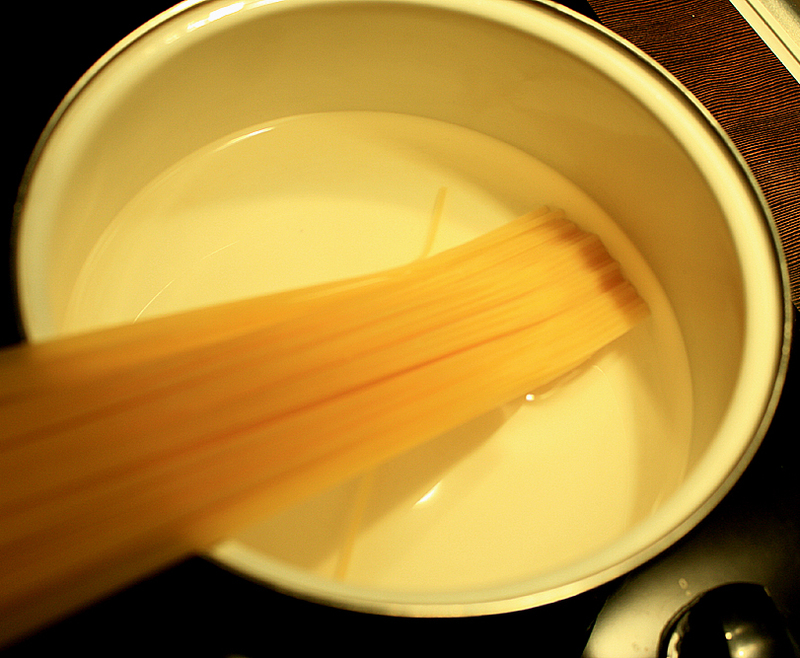 In another pot put the spaghetti with some water and boil them according to the time shown on the package. In any ways I think 10 minutes are more than enough. 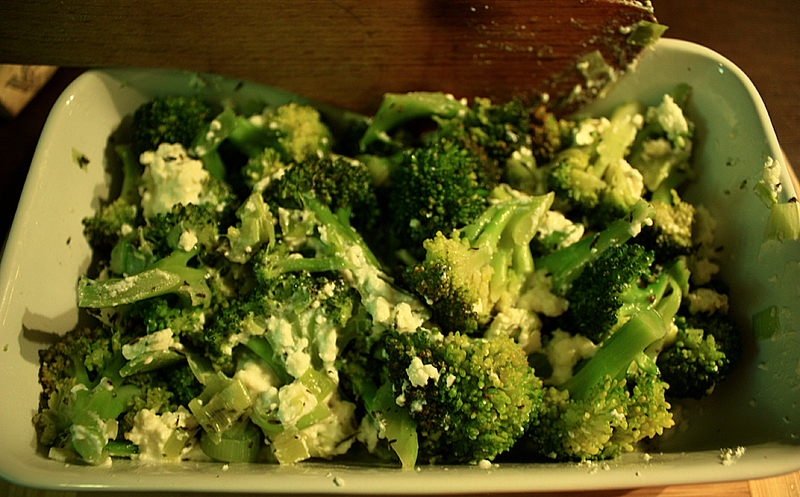 After the vegetables are ready put them in a bakin dish along with the goat cheese and the cream and 50gr water. Mix them well and put them in the oven heated to 170°C. 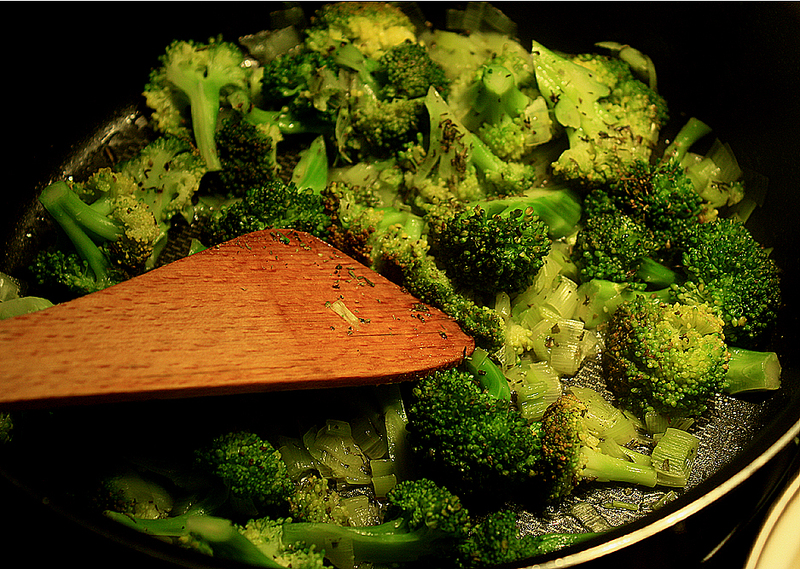 Bake them for 10-12 min until the broccoli starts getting a little brown. Meanwile put the garlic, the olive oil and the basil leaves in a wooden cup and smash them with a spoon. You can also use a kitchen robot. After the spaghetti are ready pour in the garlic sauce and mix them until they spread over the spaghetti. 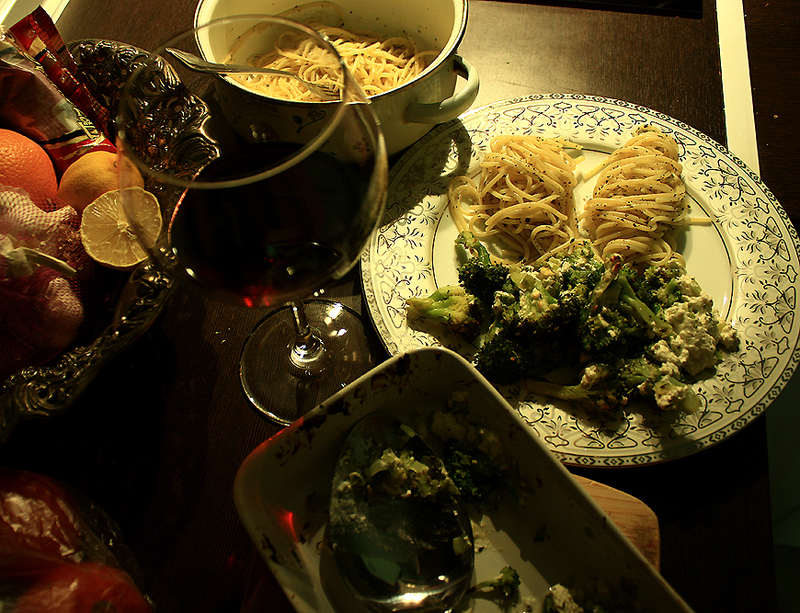 Serve the broccoli and the spaghetti in one plate. To serve the spaghetti use a fork. Roll the spaghetti around the fork and serve them like that. This makes the dish more sophisticated. This goes very very very very well with a glass of red wine:) Enjoy! Oeufs en Croustade….ok, french it is..